Anger Management: It took awhile, but I channeled my temper in some positive directions, resolved an ugly, toxic personal situation without responding in kind, accepted that which I will never be able to change, and generally walked the Serenity Prayer path every step of the way. Sometimes you really do have to turn it over to your higher power, and I did. If you're ever at the same crossroads, this is a good way to go. 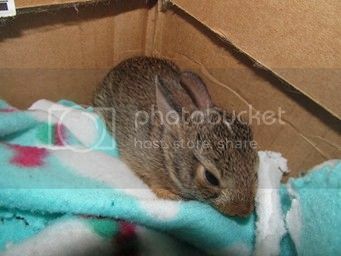 Baby Bunny Rescue: While my guy was doing the lawn he accidentally uncovered a nest of three tiny baby bunnies about a foot away from our back porch. The babies were so small you could literally hold them in the palm of your hand. Because of the damage to the burrow, and the threat of our dogs (who then knew exactly where it was) we couldn't leave them where they were, so we put them in a carrier. My daughter and I then drove for an hour through a pretty hellacious storm to get them to a volunteer at a regional wildlife sanctuary. This place will care for them until they're old enough to be released back into the wild. Best. Zen. Revenge. Ever. : This also took some time, but I straightened out all the contract headaches caused by the fake reviews posted for a story I never wrote on that site I'm never again going to mention by name here (this to keep away Googling trolls.) In the process I sold translation rights for two stories that I actually did write and made a nice pile of money. These earnings will pay for a big chunk of my kid's school expenses this semester. So in the end the mess turned into something terrific for me, and very helpful for my college kid. Edited Stuff: I finally got the chance to edit and post the final version of my Just Write novella Ghost Writer, which you can read, download, print out and share with friends for free by clicking here. Flying Solo: I handled my first major contract negotiation with a publisher in another country; this without an agent or anyone helping me. I'd say I did very well, and oddly enough the universe did not collapse. Who knew? 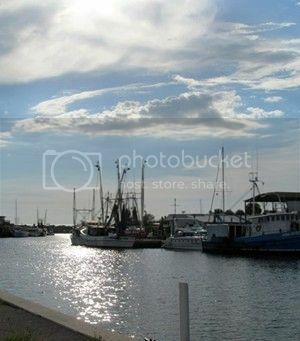 Road Trip: My family took me to a beautiful little fishing village on my birthday, where we spent the day walking around and taking pictures and having fun together. Being with my crew and recharging my creative batteries is the best way to spend any birthday. Sewed and Created My Brains Out: All the time I usually spend on the blog went toward sewing for fun and getting a jumpstart on my holiday projects. 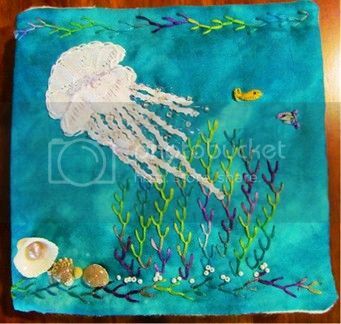 I made tons of pillows, taught myself the basics of silk ribbon embroidery (still need a lot of practice, but wow, really a cool way to embellish), designed and pieced a queen size quilt, and pattern-pieced a lap quilt, embroidered a silk needlebook with a lace jellyfish on it as a tribute to my birthday trip (see pic below), and even rehabbed an old Victorian photo album into an art journal. I also made a new and extremely creative, inspiring friend, and tried some stuff I've never done with vintage fabrics, silk and reclaimed wool. Basically eight weeks of creative bliss. Slow-Cookery: One of my birthday gifts was a beautiful multi-function slow cooker that also steams rice, makes yogurt and even bakes cheesecake. It really does just about everything but set the table for me. I then found a slow-cooker recipe book at BAM, and I'm trying a new recipe every week. This will come in handy this winter, too, when we want more substantial meals. Spruced Up: Another nice thing I did for myself was to clean up and clear out my spare bedroom and office. I'm now working on the closets in both rooms, which are way overloaded with stored stuff I'm probably never going to use again. Everything we don't want to keep will be donated to Goodwill or the Families in Distress shelter, as applicable. Wrote: About 100K altogether for the clients, but also some poetry and lots of journal entries. I also finally cleaned out the last of my e-mail accounts. I am still working on a few things yet to be decided, finalized, etc., but all things considered my two point five months away were very productive. My next post will be on this Friday, the 16th, at which time I'll explain more of what's ahead and everything that will be changing with PBW. So what's been going on with you all? Did you miss me, or was it a nice vacation for you, too? Anyone read some great books? Publish their own? Please catch me up in comments. You certainly haven't let your fields go fallow. Good for you! I'm especially glad to hear you made money on the translation rights and fixed your contract problems. You didn't just make lemonade with lemons, but you threw in a shot of vodka for kick. It's so good to hear from you again! I've been doing a ton of reading this summer. The last book I finished that I really enjoyed was “MaddAdamm” by Margaret Atwood. I thought it finished off that trilogy nicely. I'm also one of the few people in my group of friends who hasn't read the new Harry Potter book yet. I'm waiting for a copy of it from my local library, but I'm still pretty far down on the list. Hopefully I'll get to read it soon! Oh yes, you were most certainly missed! PBW has been part of my routine for a long time, so most definitely missed! Welcome back! You certainly got a lot done. I'm pretty much just gearing up for Nano at the moment. My just-for-fun writing still takes up most of my writing time though! Which I now have more of thanks to boyfriend and I breaking up. I've also been keeping an eye on one of the sub-ops you notified us about. I might just submit to them. They seem stable. Overall, thinks are chugging along. Those first two are, in my estimation, five-star knock-your-socks-into-orbit reads. The third is maybe a cut below that--I'll have to see how it stands in relation to all the other books I've read this year. Hi there! Odd coincidence that you are back today and you popped into my mind this morning. I miss my old friend. I've put my house in the old neighborhood for sale. The baby is at UCF now and Alan bought a house 1 town over so the nest is empty. Once it sells, I will be moving a few hours north. I'd love to see you again. Take care. And sold a jewelery tutorial article to the magazine of my dreams! two paid sales this summer. Co wrote a steampunk novel with a friend, and we did readings at Dragoncon together, and hung out with publishers and writers. It was a very good summer. I went to new york and north carolina too. I missed you! I am so glad you had a productive summer. Looking forward to new story snippets. Just Right soon? Please. Okay, so I'm back to say, I read Ghost Writer, start to finish today and LOVED the ending! Thank you. It was a wonderful story and I love ghosts. I'm really glad you got The-Story-You-Never-Wrote straightened out finally. I know that's been heavy on your mind for a long time. And that bunny picture is adorable! I had a turtle in the yard yesterday. We are SO far from any water where a turtle is concerned. Even though Box Turtles don't live in the water, they still like to take a soak now and then and the vegetation is much richer in nutrients by the water, so I walked him to the lake. He'll have a good home in all the places he can hide there. You're a good man, Charlie Brown ;) for taking the buns to a rehab place. They'll take good care of them. Did I mention I'm glad you're back? Welcome Back! I'm pleased that you have gotten many things resolved/under control. Last year, my tower PC motherboard died. I just finished rebuilding it and now it is one mean machine. My 10 year old laptop takes forever to load a large document, if it doesn't freeze up. The "new" tower loads the same document in seconds, and I can open many more at the same time and not affect the system at all. And it is running linux, of course. Just need to finish copying all my files so I can get back to my other projects. Looking forward to seeing you back on-line. Have a great day!!! Sounds like a productive time away. We had a crazy summer filled with two fun family trips, visiting with cousins, playing in the yard, trips to the beach (I live 1/2 mile from the ocean), and trying to keep up with my overly aggressive review schedule. I had to put off some reviews b/c I just didn't have time to read with all the fun! Welcome back! Over the summer, I focused on two things: editing an old story of my for publication and reading various books/stories by M.C.A. Hogarth, all of them space opera. I started with her Dreamhealers series, which is about the deep friendship between two psych students, one from a genetically engineered race and the other from a very secretive one. It's a warm kind of series, perfect for when you want to feel good about the world again without reading something that makes your teeth rot. I moved on to the Her Instruments series, which I have yet to finish. Same universe. More of a classic space opera feel. Very Firefly-like in its approach. Couldn't stand the main character in the first book, Earthrise, but she improves a lot in the second, Rose Point. Of the two, I enjoyed her second book the most. Ran out of money for books at that point, so I've only read the sample for Even the Wingless, and I downloaded a free short story by her called Stormfront. Oh, and I started reading The Best of Leigh Brackett. Love her work very, very much. Welcome back! I've missed your posts and good humor. Hurray for productivity, bunny rescues, and time with family! I was so glad to see that you posted something when I checked today! I have visited your blog for years and always love what you write here (and in your books!) Sounds like you had a productive and cleansing break! Howdy Stranger, long time no see! I'm glad you're back! I do especially love drooling at your amazing art and quilting. Wow. Oh, bunnies! I've started a new job, been in a reading funk, and am trying to finally get my closets cleaned out. Welcome back! Sounds like a needed chance to recharge these past months. I am looking forward to your posts. That said, congrats on fixing what sounded (and probably felt) unfixable with the 'not yours' story. And hugs for being able to know when to let go and just live. Yes, I did miss you. Sorry I didn't see you were back until today. (Silly blog feed.) I'm so glad you had a good hiatus. Yay for the baby bunnies! Yes, I missed you. Then just when you came back I got sick again so only catching up now. It's good to see you again. Missed you also! Thanks so much for saving the bunnies, I'm fortunate to have 3 living under my shed that don't feel threatened by any other animals.